Leave the SS3 road at the sign for ‘Spoleto South’, and within ten minutes you can be at one of the most charming small hotels in Italy, the Villa Milani. I did exactly this and therefore found myself with some of the most gracious and hospitable hosts I have encountered on my travels. I reproduce for you a picture of myself with them. They are Luigi and Giovanna Capobianchi. Giovanna’s maiden name was Milani, and it was her grandfather who, in the early years of the Twentieth Century, built this splendid villa on a hill overlooking the mediaeval glories of the city of Spoleto. Giovani Battista Milani was an architect of great distinction, who practised his profession mostly in Rome. But for his home in the country, he chose a location of surpassing beauty, built a handsome house and proceeded to fill it with an eclectic collection of fine pieces. 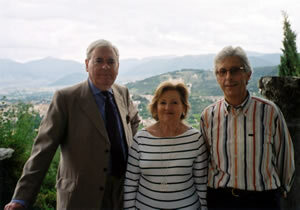 That is why the hotel now run with such friendly enthusiasm by Mr and Mrs Capobianchi is full of fine antiques from different periods. The sitting room on the ground floor (pictured) has a fireplace from the 16th Century, a doorway from the 17th Century, a library of books from the 18th and 19th Centuries, a magnificent ceiling of carved and gilded wood and a loggia with frescoes by Antonino Calcagnadoro. 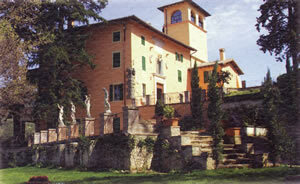 Outside, the twenty acres of parkland and woods have an Italian Renaissance garden, Roman remains and a swimming pool. The style and atmosphere are those of a grand private home. A grand private home should, of course, enjoy a magnificent view. This one does. And a room in a grand private home should take full advantage of that view. My room did. On the second floor (there is no lift), my air-conditioned billet was number six. 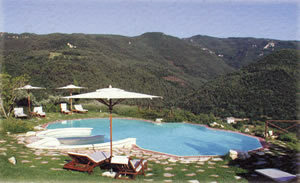 Named ‘Andromeda’, it is classified as a ‘Deluxe double’ and is therefore 300-380 euros a night, bed and breakfast for two, according to season. 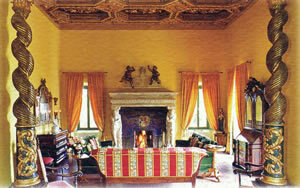 From the photograph, you will observe that it furnished with some elegance, with antique fauteuils, an extravagant headboard for the bed, an Aubusson-style rug, a parquet floor, a serpentine chest of drawers, a walnut wardrobe, a private safe and a copy of the famous Virgin and Child by Raphael. Through two of its three windows was the remarkable view (pictured). 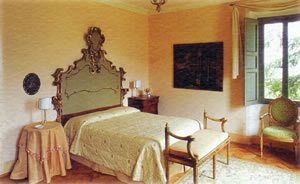 I estimated the size of this bedroom to be 18 feet by 15 feet. In the bathroom was a bidet, a loo, one wash basin and a tub of adequate size. (You should be aware that some of the bathrooms attached to the hotel’s eleven bedrooms have only showers.) I liked this apartment. I liked its quietness, and I liked most particularly the view across to the city. To look upon that as the first outside scene each morning was a real privilege. 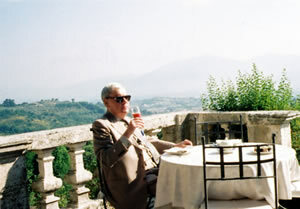 And the pleasure prompted by that panorama continued at breakfast, served on one the hotel’s terraces. I hope that the photograph of your correspondent breaking the fast conveys something of my contentment at the morning ritual. To the sound of birdsong and to the spectacle of the sun gradually dispersing the mist in the valley below, I made my leisurely way through rolls, croissants, orange juice, cornflakes, coffee and bacon and eggs. Occasionally, a bell tolled from the distant Church of SS Simone & Giuda, to mark the progress of Holy Mass. The world seemed a place of calm and contentment. 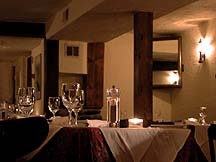 In the evenings, the two small dining rooms are used, and dinner, prepared by the family cook, is served at half past eight. Then the food is straightforward, properly prepared and carefully served. The menu changes each day, and – should you have any particular dietary requirements – you will need to discuss them with the hotel beforehand. All 90 offerings on the wine list are Italian, except the champagne and the port. 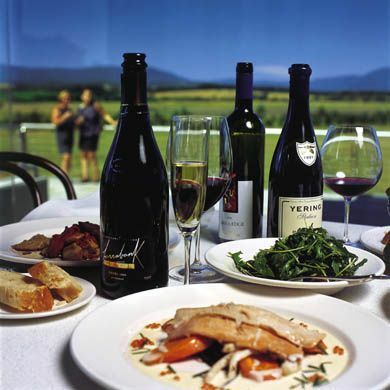 Prices range from 15 euros for an Italian sparkling wine to 278€ for the 1999 Sassicaia. 1998 Tignanello is 134€, 1997 Barbaresco from Gaja is 170€ and 1997 Brunello di Montalcino, Col d’Orcia, is 276€. Mr Capobianchi was keen that I should have some gastronomic experience of the locality, so he arranged for me to go to the castle in Spoleto (the Rocca Albornoziana) for a celebration dinner – it being 150 years since the Unification of Italy – organized by Wines of the World and the Region of Umbria. There, in a great stone hall, I found myself eating some very good food and quaffing 2008 Sassicaia in the company of wine-makers, archbishops and government ministers. As they say in polite circles, a good time was had by all. 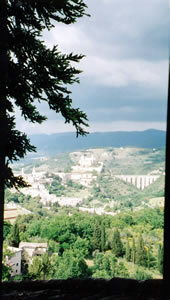 I also ventured into the charming Old Town area of Spoleto, just off the Piazza della Liberta, for dinner at the Ristorante Apollinare (via S Agata 14), and there – in a beamed and intimate room – tucked into generous portions of traditional food, much of it enlivened by the area’s pride and joy, the black truffle. I particularly enjoyed my pasta and my beef, both of which had been enriched by shavings of the divine fungus. After both these outings, a feeling of warm contentment came upon me as the taxi began to climb the hill towards the wrought iron gates of the Villa Milani. This is surely a reliable indicator of a good hotel: that one looks forward to returning to its hospitality. 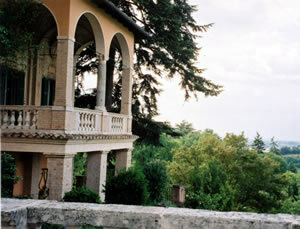 The Villa Milani has the cosseting air of a private retreat. This is a tribute to its owners, who take great care to ensure that all is well and yet never allow their presence to be obtrusive. Those who have been their guests must surely smile when they contemplate the prospect of a return visit. I certainly do. Località Colle Attivoli, 4, 06049 Spoleto, Italy.